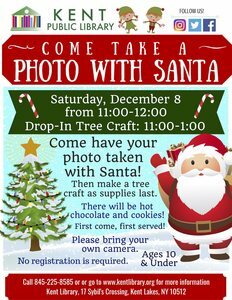 Photos with Santa This Saturday at the Kent Library! Children 10 and under may come and have their photos taken with Santa Claus at the Kent Library on Saturday, December 8 from 11:00-12:00. Then enjoy a fun tree craft and hot chocolate and cookies as supplies last. No registration is required but it's first come, first served. Please bring your own camera. The Kent Library is located at 17 Sybil's Crossing off Route 52 and can be reached at (845) 225-8585 or www.kentlibrary.org.